A United States Border Patrol agent who was shot several times Tuesday morning in southern Arizona near the Mexico border took matters into his own hands. After being hit with several bullets and sustaining multiple gunshot wounds, the unidentified agent became his own medic. US Border Patrol and the FBI are both investigating the shooting which took place on part of a 50,000-acre ranch, said Jim Chilton, the owner of the property. He claims that Mexican drug cartels smuggle drugs and people through the area, and there is only a cattle fence covering 25 miles along the Arizona-Mexico border that touches his ranch. The closest Border Patrol station is 80 miles away, according to Chilton, and cartel lookouts can easily spot agents approaching. The veteran agent who was attacked was on foot looking at some sensor equipment that had been activated. He was then was attacked in an area south of Arivaca, which is about 10 miles from the border with Mexico. He was alone when he was attacked and managed to get back to his vehicle, where he called for help and did self-care on his wounds. Authorities didn’t say in what part of his body had sustained gunshot wounds but they did say he had on a ballistic vest, according to reporting by CNN. Several people were picked up near the scene of the shooting and are being held on immigration violations, but so far, none of them have been connected with the shooting of the agent. 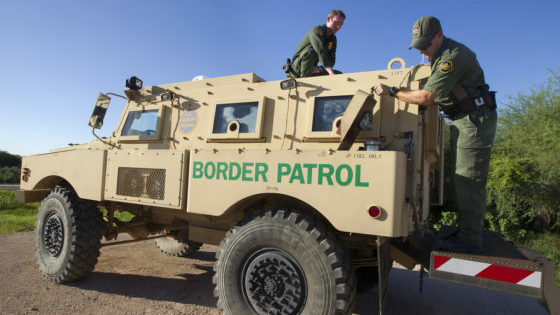 CBS News reported that shootings such as this one along the southern border highlight the dangers of patrolling the area. Despite the reporting differences, agents along the Arizona border say the threat is real. According to the FBI, the number of assaults on agents averages 428 per year. But under a new reporting policy, U.S. Border Patrol says that number is dramatically higher, but that because they multiply all the variables. For example, a 2017 incident in south Texas, involving six suspects, seven agents and three kinds of weapons, was reported as 126 assaults. This article was posted in arizona, Attacked, Authorities, border patrol agent, cartel lookouts, chief, Drug Cartels, Headline News, his own medic, Jim Chilton, medic, Mexico, multiple gunshot wounds, Rodolfo Karisch, self care, shooting, southern border, Tuscon. Bookmark the permalink. Follow comments with the RSS feed for this post.Comments are closed, but you can leave a trackback: Trackback URL.